After a frustrating deadline day, I think it's about time to start thinking about the summer, after having spent two whole days living in the present. If we're allowed to dream, what would the summer window look like for us? I'd like to see seven ins and seven outs. Sadly I've given up on Reid signing a new contract. Tevez probably not realistic,I know, but someone (major?) posted a rumour of him coming in the summer and I'm willling to believe that rumour . IMO, a squad similar to that would be able to manage playing in europe aswell as qualifying for europe the season after. Net spend just over 30 mil, not unrealistic considering comments made from the board. Would love to see your suggestions aswell! Yes, I agree to all the outs but would also get Nolan on the coaching staff. 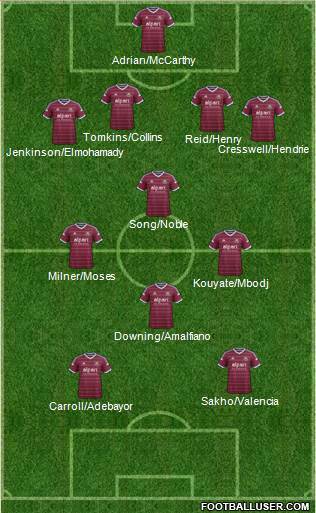 Think we would have enough cover in midfield with Kouyate, Noble, Song (if signed), Zarate, Downing, Amalfitano (new contract? ), Diego Poyet. Always thought Shelvy could do a job for us. Other than that, I would like to see the same as this year with a few big name loans with a view to buy. if we could fit in Yevhen Konoplyanka somewhere in that I would be over the moon. He is on a free this summer and wished we had tried a pre contract last week. Come the summer I reckon Tottenham will get him. Agree with moving Nolan into the coaching set up, he has a lot to offer. Agree with that. I was looking for a deputy to Downing, Konopylanka was a cut above that. Always liked the look of Boyd, and he would be a great optIon alongsida Zarate and Morgan if Downing needs to be rested or picks up an injury. Did n't see Nolan quitting football or leaving the club as realistic options. Would n't mind using him an a coaching role after next season though! Some people aren't too keen on it, but there are players we should be looking at from teams if they go down. The likes of Charlie Austin, Caulker (I rate him), Kieran Trippier from Burnley would solve the 4th striker (Carlton and Zarate leaving) 3rd CB and 2nd RB position for about £10 million shall we say? I say 3rd CB on the presumption Reid leaves and still looking for another big main CB to come in. That then gives us another £20 million or so to strengthen with Jenkinson and Song etc. Still undecided on Shelvey though. To add to the players you wrote, I would really like us to take a gamble on Aiden McGeady who I think gets some unfair stick at the moment. Should be in our range. Virgil van Dijk as a ballplaying central defender and a player like Scott Brown to take Nolan's place would be ideal. A proper fighter who gives his all everytime. Freiburgs Darida looks a real player as well, and would probably be my pick over Shelvey at around the same price. A cheeky offer for David Marshall at Cardiff to fight it out with Adrian seeing as they are doing horribly and mad man Tan might sell out soon. Chuck 500k at them for Declan John as well and we could have a real player on our hands in a couple of years with a bit of luck. I'd be all for Caulker if they go down, and Charlie Austin as a reincarnated Ashton yes please. Guidetti could be an option seeing as his deal at City is up in 6 months, cool character and good talent imo. RB: Demel (released) --------------- Elmohamady (Hull, if relegated) - that Trasch bloke is on a Bosman. Don't want that diving **** Moses or that cheating **** Elmohandball anywhere near my club. I'd like to see a Will Hughes from Derby if they don't come up & I'd also take punt on a player like Bamford who has proven himself at Championship level plus I do like Dan Burn. Watching Clough for Bolton last night looks a tidy player! Plus a good back up RB maybe a winger at a push. bobo wrote: I'd like to see a Will Hughes from Derby if they don't come up & I'd also take punt on a player like Bamford who has proven himself at Championship level plus I do like Dan Burn. Watching Clough for Bolton last night looks a tidy player! Lennon should never have taken him off. That and the sending off changed the game. can't see oxlade-chamberlain getting much first team action in the present arse squad, letalone after the summer when arsene brings in another fistful of attacking midfielders. could do a job for us I reckon, and is good mates with jenks. would worry that we'd start to look like an arsenal tribute band. only1post wrote: Don't want that diving **** Moses or that cheating **** Elmohandball anywhere near my club. Cheating, diving, handball, Aids >>> morphing names with insults. Secure reid, jenks and song to long term contracts. Add a young CB, i don't know much about that Doria, but that type of signing. A pacey winger, who can actually cross and finish, and a playmaker. The way i see it, the way to start improving our finances is either the SSouthampton route of relying on the academy to produce first team quality players, or the spurs route of investing in highly rated prospects just before the top teams show any interest. Is Celtic your Scottish team by any chance ? If Villa go down and we sell one of Sakho or Valencia then we should throw our hat into the Benteke ring with big money. A battle we can win? Not sure, but worth a go. Westwood isn't an awful player, and Baker looked decent against us and would be a cheap spare centre back.